Replacement every 100,000 miles or 10 years. Replacement every 150,000 miles or 10 years. Camshaft setting bar – Ford No.303-376 (21-162-B). Camshaft sprocket puller – Ford No.303-651 (21-229). Camshaft sprocket holding tool – Ford No.205-072 (15-030-A). NOTE: Vehicles built before 08/00 are fitted with manual tensioner which must be replaced with an automatic tensioner. Disconnect intake air temperature (IAT) sensor multi-plug. Turn crankshaft clockwise until just before TDC on No.1 cylinder. Ensure camshaft parallel groove aligned with edge of cylinder head. Remove blanking plug from cylinder block. Insert timing pin  . Tool No.303-193 (21-104). Turn crankshaft clockwise until it stops against timing pin  . Fit flywheel locking tool  . Tool No.303-393 (21-168).NOTE: Crankshaft web MUST remain locked against timing pin. Fit setting bar to rear of camshaft  . Tool No.303-376 (21-162-B). Turn tensioner pulley clockwise away from belt  . Use Allen key. Lightly tighten bolt  . Hold camshaft sprocket  . Tool No.205-072 (15-030-A). Slacken camshaft sprocket bolt  . Loosen camshaft sprocket from taper  . Tool No.303-651 (21-229). Ensure camshaft sprocket can turn freely without tilting. Remove timing belt.NOTE: DO NOT refit used belt. NOTE: If manual tensioner fitted it MUST be replaced with automatic tensioner. NOTE: Refer to Ford dealer for revised tensioner. Ensure new timing belt has etched FORD logo denoting latest type. NOTE: Ensure engine is cold before installing belt. Ensure crankshaft at TDC on No.1 cylinder. Ensure flywheel locking tool located correctly  . Ensure automatic tensioner at position shown  . 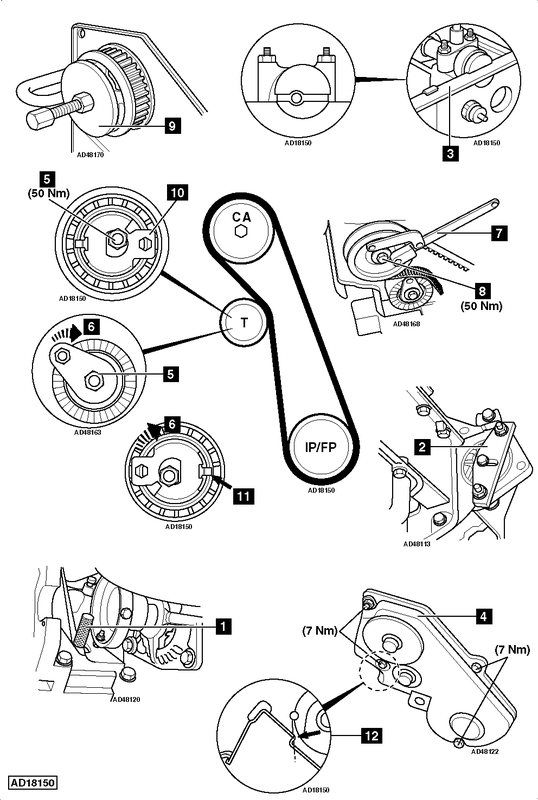 Fit timing belt in anti-clockwise direction, starting at injection pump/high-pressure fuel pump sprocket. Ensure belt is taut between sprockets on non-tensioned side. Ensure directional arrows point in direction of rotation. Turn tensioner pulley anti-clockwise until pointer at position shown  . Use Allen key. Tighten tensioner pulley bolt  . Tightening torque: 50 Nm. Tighten camshaft sprocket bolt  . Tightening torque: 50 Nm. Remove tools  ,  &  .NOTE: If necessary, mark crankshaft pulley with paint or chalk. Turn crankshaft almost 6 turns clockwise. Turn crankshaft slowly clockwise to TDC on No.1 cylinder until crankshaft web against timing pin. Fit flywheel locking tool  .NOTE: Crankshaft web MUST remain locked against timing pin. Ensure tensioner pointer at position shown  . If not, repeat installation procedure. Ensure setting bar can be fitted to rear of camshaft  . If not, repeat installation procedure. Remove tools  ,  &  . Fit blanking plug to cylinder block. Tightening torque: 24 Nm. If manual tensioner replaced with automatic tensioner, modify timing belt cover. File off inner corner  .